Protestantism came to the Miramichi between 1765 and 1800 with the arrival of Scottish immigrants. The first Presbyterian Church on the river was established at Wilson’s Point on Beaubears Island after 1792. The first settled minister was the Rev. John Urquart, who held services on alternate Sundays at Wilson’s Point and a second church at Moorfield. Rev. Urquart drowned in 1814 while crossing the Miramichi River. 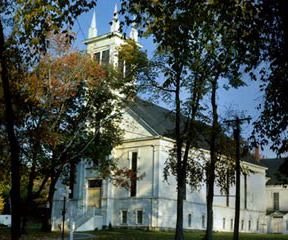 In 1816, a congregation separate from Moorfield was organized at Chatham. The next year St. Andrew’s Church was built adjacent to the present St. Andrew’s Cemetery in east Chatham. The Reverend James Thomson was called from Lockerbie, Scotland as its first Minister. He served until his death in 1830 at the age of 51. He preached at Wilson’s Point and was noted for provision of relief and comfort after the Miramichi Fire in 1825. At the time of Rev. Thomson’s death, the congregation included established Kirk people and antiburgher secessionists, a division that occurred in Scotland in 1733 over the patronage issue. After an acrimonious dispute, the secessionists decided to build their own church, St. John’s Presbyterian, on the northeast corner of Church Street and University avenue in 1832. This building was replaced in 1902 by a magnificent Gothic structure on the corner of Cunard and Wellington Street which has since been dismantled. Older residents will recall it as the Capitol Theatre. Rev. John McCurdy was ordained as the first minister of St. John’s in 1831 and served the congregation for 37 years. It is interesting to note that he married the second daughter of Rev. James Thomson of St. Andrew’s in 1835. The first St. Andrews United Church which was destroyed by fire, January 19, 1976. With the increase of population due to emigration from the British Isles after 1800, other faith groups became present on the river. Wesleyan Methodists established a congregation and constructed a chapel on the southwest corner of Duke and Cunard Streets. This congregation eventually built St. Luke’s Methodist Church in 1886 on the present Masonic Hall site on Wellington Street. The St. Andrew’s congregation, experiencing growing pains and an outmoded facility, built a new church on the present site in 1865. the St. Andrew’s and St. John’s congregations united in 1921 to form the United Church of St. Andrew and St. John. The St. John’s facility was sold at that time. Both congregations had belonged to the Presbyterian Church in Canada since its inception in 1875 and both had found it difficult to operate with diminishing memberships. 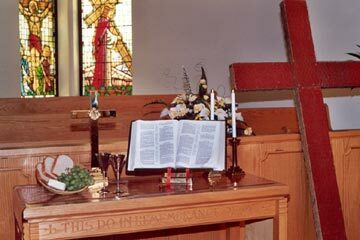 In 1926 St. Luke’s Methodist joined the Presbyterians as part of the newly formed United Church of Canada. Wisely, considering the turmoil of the union, the name chosen for the combined congregation was “The United Church of Chatham”. In the 1970’s the congregation voted to be called “St. Andrew’s United Church” and thus it is today. 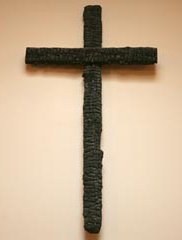 Burnt timbers from fire in 1976 form a cross on the wall of the present brick structure. In 1947 a warehouse fire on the Chatham waterfront spread to several buildings in the town including St. Andrew’s Church. The main church building suffered major fire and water damage resulting in the temporary closure for repairs. Services were held in St. Luke’s Hall, presently the Royal Canadian Legion building which had been kept in use for Sunday School since the 1925 Union. In the early 1950’s a steel support system was installed under the building. The basement was converted to a church hall and named St. Luke’s Hall to maintain the historic connection to St. Luke’s Methodist Church. The original hall was sold to the Legion at that time. On the evening of January 19, 1976, after a 111 year history, a spectacular fire destroyed St. Andrew’s United Church. The present brick structure was completed debt free in 1978.